Off the island of Pohnpei in Micronesia, lies the ancient city of Nan Madol, the only ancient city ever built upon a coral reef. Comprising a set of almost 100 stone and coral fill platforms atop artificial islands separated by narrow channels and enclosed by an outer seawall, Nan Madol is an engineering marvel. Yet despite the enormity of the undertaking in building the city, no records exist as to when exactly it was built, where the enormous rocks came from, how they were transported there, and for what reason it was constructed on top of a reef. Evidence of the early human activity on the islands dates back to the first or second century BC, but it is not known exactly when the construction of the artificial islets started. Theories range from the 5 th to the 11 th century AD, purportedly built as a ritual and ceremonial centre for the ruling chiefs of the Saudeleur Dynasty. The Saudeleur dynasty was the first organized government uniting the people of Pohnpei island, ruling from around 1100 to around 1628 AD. However, this era was preceded by the Mwehin Kawa (“period of building”) and Mwehin Aramas (“period of peopling”). 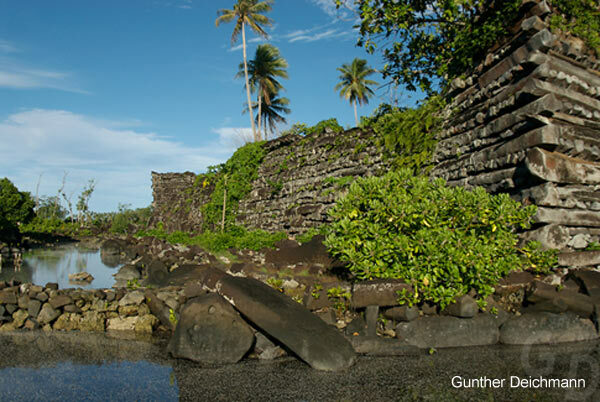 The name Nan Madol means “spaces between” and refers to the canals that criss-cross the ruins. However, its traditional name was Soun Nan-leng (Reef of Heaven), according to Gene Ashby in his book Pohnpei, An Island Argosy . The total area of the enclosure is 75 hectares. The foundations of the islets were constructed of huge basalt boulders, on which walled enclosures were built using columnar basalt in a header and stretcher pattern in-filled with coral rubble. Walls were as high as 15 metres and up to 5 metres thick. The average weight of each stone is 5 tons, with some weighing as much as 50 tons and it has been estimated that the total weight of the columnar basalt that makes up the city’s construction is up to 750,000 metric tons. Probable quarry sites around the island have been identified, but the exact origin of the stones used in the construction of Nan Madol is yet to be determined. No quarries exist in the immediate vicinity meaning that the stones must have been transported to their current location. What is even more incredible is that the builders managed to accomplish the task without pulleys, levers or metal to aid in the process. Most Pohnpeians still believe the legend that Nan Madol began with the arrival of twin sorcerers Olisihpa and Olosohpa from the mythical Western Katau. The twins were said to be much taller than native Pohnpeians. The brothers sought a place to build an altar so that they could worship Nahnisohn Sahpw, the god of agriculture. The two sorcerers successfully built an altar at Nan Madol, where they performed rituals to levitate the huge stones with the aid of a flying dragon. When Olisihpa died of old age, Olosohpa became the first Saudeleur. Historians and archaeologists have suggested that they huge rocks may have been floated via raft to the islets, however, the exact means of engineering with which the massive stones were moved from their distant quarries, over land and water, and erected on the reef complexes is still unknown. According to UNESCO, Nan Madol represents a “globally significant masterpiece of creative genius” because it exhibits the most perfectly preserved habitation, leadership and ceremonial plan of an architectural ensemble of the Pacific region. Nan Madol housed the ruling elite caste of Saudeleur dynasty and was used as a political and ceremonial seat of power. As a means of control of their subjects, Saudeleur rulers forced local chieftains to leave their home villages and move to the city where their activities could be more closely observed. The islets to the northeast, particularly Nan Douwas, were used for rituals and ceremonies, while over time all the seawall islets (nearly 60) functioned as burial places. Other islets were administrative and residential, and some served special purpose, such as food preparation, coconut oil production or canoe construction. Rule was maintained by one man, the Saudeleur, at Nan Madol. The land, its contents, and its inhabitants were owned by the Saudeleur ruler, who leased the land to landlord classes overseeing commoners harvesting the land. The commoners were required to present the ruler with frequent tributes of fruit and fish. The logistical difficulties of the site, which involved having no fresh water and no place capable of growing crops, were not a problem for the Saudeleur because the people of the islands brought everything that was needed. The Saudeleur dynasty ruled the islands for more than a millennium, yet there is nothing left of them but legend and the crumbling black basalt ruins. No art, no carvings, no writing. The only knowledge that remains is that which has been passed down through oral history by the Pohnpeians, who describe the Saudeleurs as deeply religious, tyrannial and cruel, and the remains of their civilization are often viewed with fear and superstition by modern-day Pohnpeians. According to local lore, the ultimate downfall of the Saudeleurs was their increasingly oppressive rule and centralised social system. The dynasty was toppled in 1628 by the semi-mythical warrior Isokelekel, who came from the island of Kosrae 530 km to the east, creating the modern Nahnmwarki system of tribal chiefdom that has existed in one form or another to this day in the island’s five municipalities. 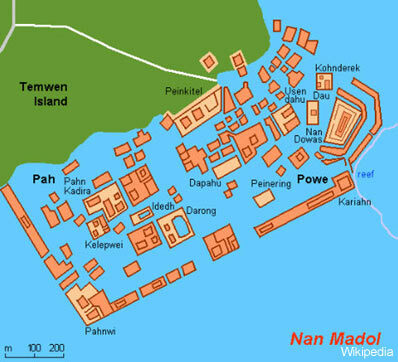 There is great variation among sources for the exact events before, during and after the invasion of Nan Madol by Isokelekel; at least 13 different accounts of the war have been published and told by the the Pohnpeians. In most versions of the legend, the Saudeleur ruler had become oppressive and its lords had offended the Thunder God revered by the Pohnpeians. The Thunder God left Pohnpei for Kosrae, where he impregnated a human by feeding her a lime. This union produced the semi-divine Isokelekel, who in the womb knew his destiny of vengeance. There are many accounts of Isokelekel’s battle with the Saudeleur ruler. In one version, Isokelekel's warriors are aided by hidden weapons that suddenly appeared. The tide of war reversed several times, but ended against the Saudeleur, who retreated with his army into the main island of Pohnpei. Legend recounts that the battle ended with the Saudeleur lord retreating uphill to a stream, where he transformed into a fish and remains today. Isokelekel took the title of Nahnmwarki and assumed the seat of power in Nan Madol as had the Saudeleur Dynasty before him. When the period of the Nahnmwarkis began, the new rulers at first resided at Nan Madol but they could not depend on anyone regularly supplying them with food and water and eventually they moved back to their own districts, abandoning Nan Madol forever. By any measure, the city of Nan Madol is impressive. The work required to build it was on such an enormous scale, yet the current inhabitants of Pohnpei live in humble grass huts. What accounts for this huge contrast? More importantly, how was the city built in the first place? The fact that there are no existing records on Nan Madol means that we may never know the secrets buried within the walls of this unique coral reef city. 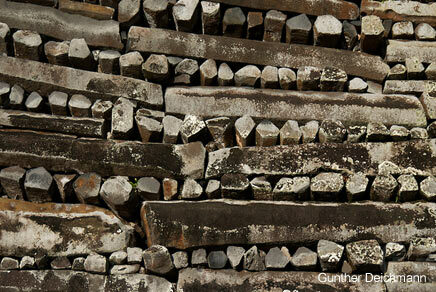 Featured image: The ancient Nan Madol Ruins. Photo Credit: Gunther Deichmann . I read somewhere that the basalt was gathered from an island 7 miles away. But what baffles me is how they would have transported a 50 ton column on primitive boats. But even more puzzling is how they managed to quarry it, transport it to the shore, load it up, transport, unload, and install. Were there even enough workers to use pulleys, fulcrums, and support to even move a 50 ton behemoth? And since it cannot be carbon dated, we'd have to date it according to the ocean levels at the deepest part of the city. Around 12000 BC our ocean levels were about 100' or so lower than now, so in that sense we could figure the place was built before the last glaciation had melted away (raising sea levels), or that the island has sunk back into the crust from the sheer weight of the added stone. Very interesting, this reminds me of some underwater cities from around the world meet coral castle. I need to do some more research on these people and see what else they were about, what they did, what they built. I love lerning new things and this is one area of my interests. this is also a prime example of perhaps a flood hitting leaving there people to rebuild over the years and forcing them to live in grass huts. Knowledge is like the stock market and so if everything in life. Ups and downs, growth and decay. Really got me interested in these people. They certainly have a colorful history of origin,, and I enjoyed finding out more about them. I continue to be surprised at just how little we actually know about our predecessors and their technology.